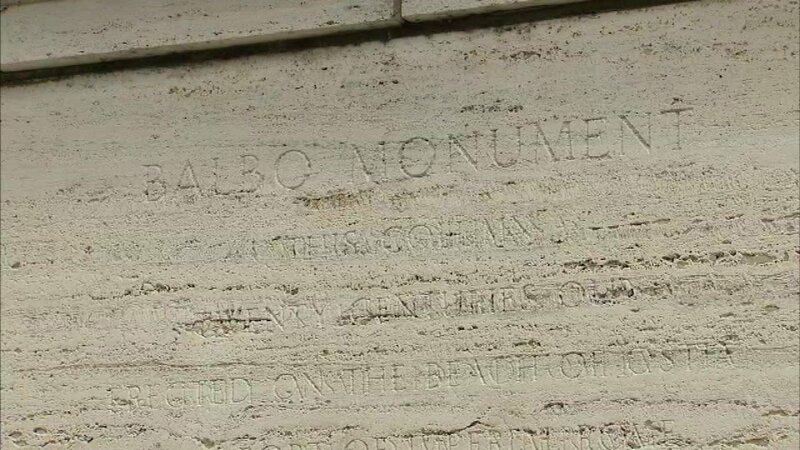 CHICAGO (WLS) -- There's a call for the removal of a monument given to Chicago by Italian dictator Benito Mussolini, and to rename the street named for Italo Balbo. Dozens of protesters gathered in the shadow of a pillar engraved with words from Mussolini. It is a gift honoring Italo Balbo, which the dictator gave to Chicago in 1933. "Chicago stands with all the communities around the country, to stay monuments have to go, especially when they represent a racist history of America," said Bishop Gregg Greer, who was protesting the Balbo monument. Mayor Rahm Emanuel was testy earlier Wednesday when a reporter asked him about the Balbo monument. "You don't have to ask me what my position is on fascism. I'm against fascism, Ed. Take a chill pill will ya," he said. "This is fascism. It's racism. And if he means it, if he understands fascism then he should take the monument down," said John Beacham, ANSWER Coalition. But some Chicago Italian-Americans believe Balbo is misunderstood. "When Mussolini went pro-Nazi, Balbo said absolutely no way," said Lissa Druss, Joint Civic Committee of Italian Americans. "Balbo is a hero to the Italian American community and also the aviation community. There is no reason why this should even be part of a discussion, he was anti-Nazi."